The Drager Evita XL ventilator is a feature-rich design that helps the caregiver deliver comprehensive, optimal ventilation — from implementation to the weaning process. The monitor responds quickly to individual patient requirements and ventilation situations for increased patient comfort and safety. The Drager Evita XL Ventilator offers mask ventilation with NIV plus, which in many cases reduces the need for intubation. When intubation is necessary, the ventilator’s integrated CO2 monitoring helps caregivers ensure correct placement and metabolic stability. Select workflow support functions, including routine O2 suction or automatic P0.1 measurement, can also simplify clinical routines. 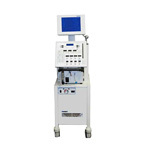 A unique trolley system allows staff to easily maneuver the Evita Drager ventilator throughout the care facility. Open breathing system with AutoFlow or PCV+ allows spontaneous breathing in all ventilation modes. SmartCare / PS automated weaning system provides continuous vigilance for opportunities to reduce the level of ventilator support. Automatic tube compensation supports respiratory independence during the weaning process.